Technology is now part of everyday life and when traveling we don’t just bring one device away with us but a plethora of smartphones, laptops, and tablets. The average technophile guest carries 1.71 smartphones and 1.49 laptops in the traveling party and the millennial age group carry even more, an average of 2.48 smartphones and 2.22 laptops per travel party – they also carry more tablets, too. Technology for consumers means an easy life and our appetite for this lifestyle is insatiable, so not surprisingly, guests want to interact with the hotel via their devices throughout their stay. However, with the multitude of available technologies on the market today, from robotics, apps, smart mirrors, docking stations, chatbots, self-service, TV software and everything in-between – which can all change rapidly over time, hoteliers have been confused about what technological amenities they should offer to meet guest expectations and drive guest satisfaction. (And even the literature review shows that not all the technological amenities implemented in hotels have been appreciated by guests!). If you are looking to up your amenity offerings this year, here are some key areas to focus on. WiFi: This is one technological amenity that should be right at the top of the list – this is one that is now expected and assumed. Why? Well, it’s 2018, and we’re all connected. We’ve and obsession with connecting to the internet so, it’s not really surprising that free Wi-Fi is considered an absolute must, if anything, it has become a deciding factor when choosing a hotel. According to a study by Research + Data Insights complimentary WiFi came in second only to cost when considering booking a hotel stay. The survey also revealed that seven out of 10 travellers’ rate reliable WiFi as a higher priority than a hotel’s location, parking, or even complimentary breakfast. It’s also important to remember that your WiFi service is only as good as the Internet service that supports it – as slow internet speed is consistently ranked as the number one complaint among hotel guests. The same Research + Data Insights survey found that 80% of travellers said WiFi with guaranteed speeds makes a hotel brand more appealing, and another study commissioned by NETGEAR revealed as many as 73% of guests under the age of 35 would never return to a hotel with poor Wi-Fi. Conversely, guests who are happy with the Wi-Fi will spend 50% more money at the hotel than average. So, long gone are the days of “free Wi-Fi” meaning single-bar coverage only on that one special cushion of the couch in the lobby. WiFi has become a basic expectation and it must be fast, free and reliable. Self-Service: Earlier this year, we saw the debut of Amazon Go’s first automated retail store in Seattle which allows customers to enter, shop and check-out their purchases without any interaction or physical cash/card exchange. Instead, when you arrive at the store, you scan your phone, and the store’s automated systems track what you grab with 100 cameras before automatically charging you the correct amount upon departure. Large-scale examples such as the Amazon Go store, Uber Eats and purchase kiosks, demonstrate the way in which customers are increasingly embracing this kind of technology and widespread shift to the self-service model, and the hotel industry is no exception. A growing number of guests now expect to find a kiosk at the hotel lobby and/or be able to control various aspects of their stay like check-in, keyless entry, housekeeping services, messaging, payments, etc. from start to finish via their mobile devices. According to a recent study by Zebra Global Hospitality, 70% of guests want to use their smartphone to speed up check-in and services and another study revealed that 63% of guests prefer hotels with a tech-enabled lobby. Not only that but when solving a problem or for housekeeping service, 43% of guests noted they would prefer to communicate with the hotel via mobile. As consumers, across all age ranges, become more and more attached to their mobile devices, self-service options provide an additional choice to guests who prefer to communicate and interact via technology. Streaming: When it comes to in-room technology, smart mirrors and climate controls have been featured as the next big thing and while they do seem cool, when it comes down to essentials, guests really just want to easily access and consume their content, the way they do at home, if not better. What are we talking about? The humble in-room TV. Gone are the days of on-demand, pay per view services and in its stead is the want to stream movies and TV shows using personal accounts via the hotel TVs – it’s just so much nicer and more comfortable to watch your latest Netflix obsession on your room’s big television, instead of propping up your computer or iPad in bed! An In-Room Entertainment Preference Study by ADB found that most guests, across all age groups, have accounts with Netflix, YouTube, Amazon Prime, and Hulu and guests, particularly Millennials, really do want to view their own content on hotel room televisions. While some cutting-edge hotels offer smart TVs, through which you can log in to your streaming services, these aren’t exactly widespread. So not surprisingly, the study also found that currently, 57.4% of guests are attempting to connect their own devices to the in-room TV (via a cable or streaming device) and 62.1% of Millennials, 52.2% of Gen X and 17.2% of Boomers are already using their own devices to stream media while at the hotel! – Where there is a will, there is a way! Power: Ever stayed in a hotel room where it turns into a frustrating game trying to find an outlet or to find out that there just aren’t enough! It might not seem obvious, but when you’re thinking about hotel tech, it’s not just about the software or applications that enhance guest experiences. It’s also about the power sources that make technology and modern life possible. Research suggests a single traveler may carry upwards of three devices when they travel and at present, about 34% of business travelers want access to more USB ports and power outlets in their guest room. The new Canopy by Hilton brand, which debuted in Reykjavik, Iceland last year, was designed to have about 20 outlets and USB ports in each guestroom. “Our guests are busy and do not want to spend time searching for outlets or leaving devices in inconvenient locations- they want their devices charges and in easy to reach locations and we have ensured our rooms and public spaces make this happen,” Gary Steffen, Global Head of Canopy by Hilton. So just remember, when thinking of technological amenities, be sure to consider strategically placed electric outlets and ports, and plenty of them! 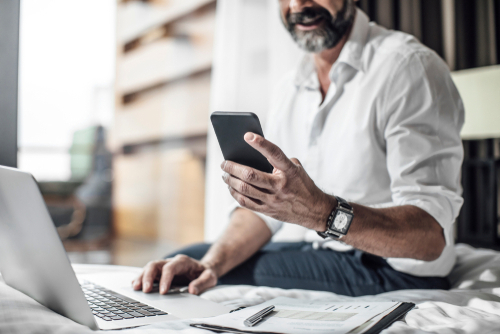 As the traveling public continues to become more technologically savvy, hotels must evolve, change and adjust to new demands to meet guests’ growing technological expectations. And the right mix and offering of guest oriented technological amenities will not just enhance guest satisfaction but also the performance and functionality of hotel staff and has the potential to increase revenue opportunities.